Last Christmas Clara was two. She was excited about leaving out cookies and milk for Santa but still took a lot of prompting to remember what she was doing and why. Needless to state, she didn't make herself sick with excitement the night before Christmas waiting for Santa to show up. Yes, I am THAT mother. The one who wants her daughter to stare at the ceiling all night long straining to hear reindeer hooves on the fire escape. I stubbornly believed in Santa until I was almost ten, and still kinda do. This year I want to make Clara as over-excited as possible. I already have her hooked looking at all the Christmas decorations all over the neighborhood and I know I'll have to actually hide all her presents this year or else she'll TOTALLY find them. Tomorrow we're breaking out the advent calendar. Open a little door EVERY DAY and get a little prize! (WHAT!? AWESOME!) This is good training for Clara as she will become my willing accomplice as the years go by in making her baby sister totally over-excited about Christmas as well. 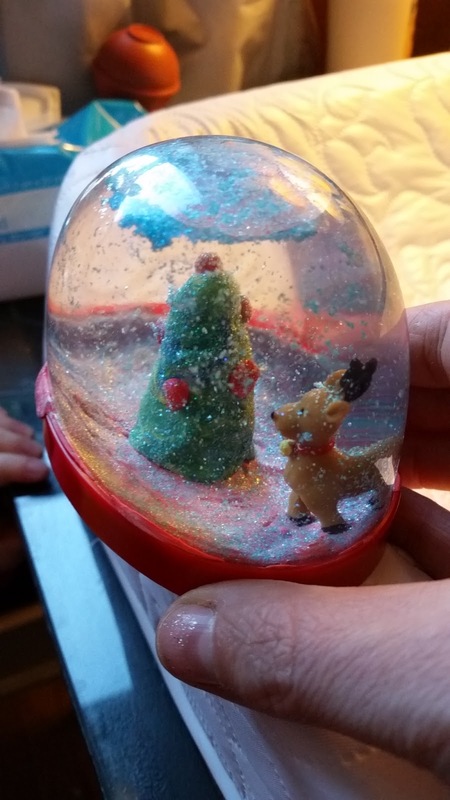 We made this snow-globe craft together. I think Clara did a really good job making the tree. Maybe I'm biased, or maybe I just LOVE CHRISTMAS! On Sunday, Gerald sat Clara down o help her write a letter to Santa. He took down everything she wanted to say. Thank you so much, Santa! Love, Clara. Now did Clara really understand the whole "I've been a good girl this year" thing? I'm betting not but I give Gerald major Christmas points for working it into the letter. 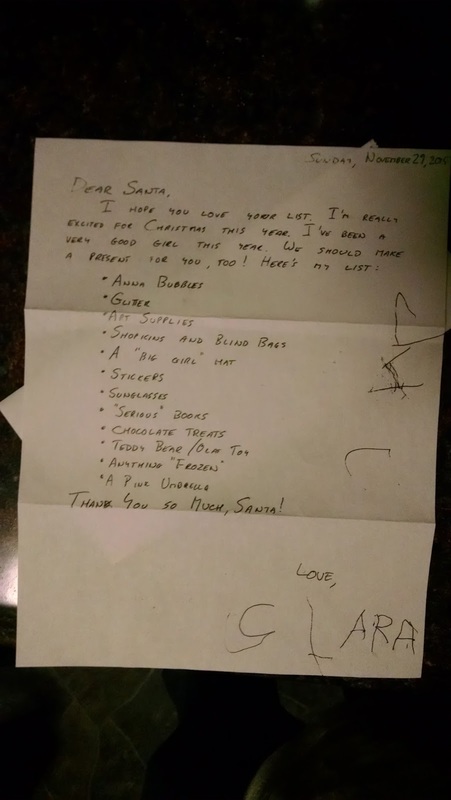 I like how Clara is trying to soften up Santa with the whole "we should get you a present too, Santa." Good woork, little girl. 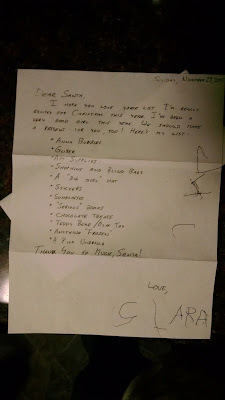 I find Clara's present list both heartwarming and hilarious. Let me first address the "Shopkins and Blind Bags" request. For those of you not in the know - Shopkins are tiny. cheaply made toys that come in tiny shopping baskets. But here's the kicker - you don't know what one you're getting until you open it- and you know how little kids love surprises. Each shopping basket comes with a list - a key if you will, of the names of each of these little cheap pieces of plastic and whether or not they're common,rare, super rare....etc. So for the bargain price of 3.00 if you might get a pinky nail sized coffee pot named "Coffee Drip", and a sneaker with glamorous eyes named "Sneaky Wedge." At least you get two to a basket. We can thank You Tube and the Disney Cars Toy Club channel on aforementioned You Tube for introducing Clara and by extension, her parents, to the wonders of Shopkins. Clara would watch Amy Jo unwrap Shopkins for HOURS on You Tube if we let her. When we buy her Shopkins as treats she always says "I hope we don't get a duplicate," just like Amy Jo does. It's ridiculous. But who am I to talk? I collected Garbage Pail Kids. Anyone have some suggestions for "serious" books for a three year old? What does she mean? Who knows? Better get cracking, Santa. And while you're at it, keep a lookout for a "Big Girl" Hat. Just cross glitter off the list, Santa, and please take note of Clara's three references to Frozen. Anything Frozen - she's not discriminating. She might even sing you all the songs from Frozen if she catches you putting presents under the tree this year.